Having a drink in an ice bar first made it onto my bucket list a few years ago after my friend, Tina, posted pictures of her visit to The Absolut Ice Bar in London. I had not realised that these places existed outside of cold countries! My partner was less excited, and refused the London bar, the Orlando Bar and the Las Vegas Bars when we found them on holiday. He reasoned that if he was going to do it-he wanted to do it in an ice hotel, or at least somewhere very cold where it was fitting to do so. I think he had a a fair point in retrospect. We did almost go to the one in Vegas until we realised that they would not let you take pictures in there. I definitely wanted to be able to immortalise the experience in pictures. During our visit to The ICEHOTEL in Sweden we were able to visit UNIQUE ICE BAR, which was the largest ICEBAR in the world. The entire place and it’s contents are made of ice and snow, even the glasses are made of ice! The bar was lit with LEDs that were actually frozen into the ice (as LEDs don’t emit enough heat to melt the ice). When you order your first drink, you have to first buy the ice glass for 25 SEK (about £2.50 GBP), the drinks were a further 85SEK (about £8.00-YIKES!). 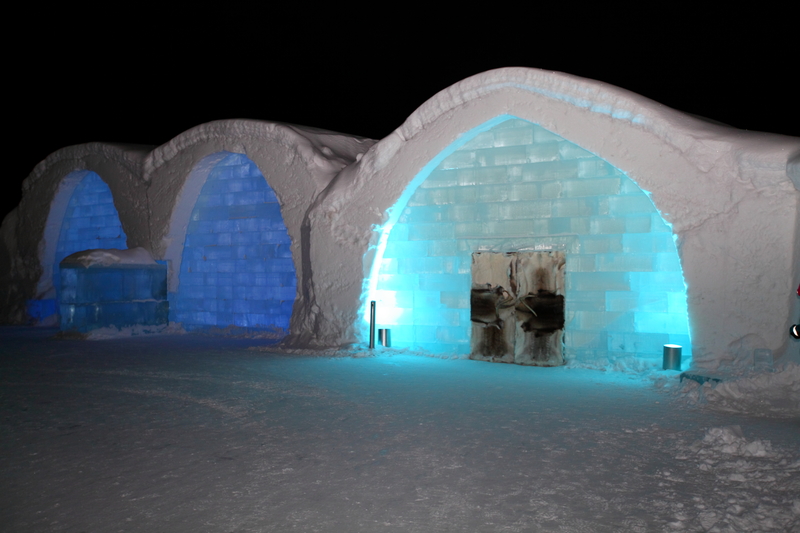 This isn’t just ICEBAR though, Scandinavia is exceptionally expensive for alcoholic beverages! You can order as many drink refills as you wanted in the same glass until either you abandoned the glass at the end of the night, or it melts with your body’s heat. Most drinks were vodka based, since vodka wont freeze. After 3 drinks, The heat from my lips had worn the rim of my glass pretty thin. I think 5 drinks would have been about the maximum before it started to look like the glass was smiling back at me. It is the biggest in the world. At £8.50 for a double shot sized drink, you would have needed a decent budget to get merry. The bar wasn’t exactly lively which was a shame, as it lacked atmosphere. The music also seemed to be ABBA, dance remixes of ABBA and a Madonna track that sampled ABBA, which did get a little tedious after a while. As a brief experience, it was fun however! I am pleased to say that this item is ticked off, and whilst I wouldn’t rule out another trip to an ice bar for a special celebration with others; I do feel that I have ‘been there, done it and worn the tee-shirt now’ with this one. It’s not something I’d make a regular habit of doing. I would like to publish a guest post (with one link) on your great blog – emmasbucketlist.com. Could you please give me the price for the placement of it?